WHAT’S BEHIND THE SURGE IN VIOLENCE IN JERUSALEM AND THE WEST BANK — AND WHERE WILL IT LEAD? If you follow the news, you’ve probably heard about the young Palestinian man who rammed his car into four Israeli policewomen at a Jerusalem tram stop on March 6, then hacked a passerby with a cleaver. But here are some other stories you probably haven’t heard. In the first week of March alone, two young Palestinian men were shot as they fought against a raid by Israeli soldiers in Dheisheh refugee camp near Bethlehem. Shots were fired into an Israeli home in the West Bank settlement of Shomron, and at an army jeep near Nablus. A West Bank teenager armed with a knife was caught by police at a border crossing, and told them he planned a stabbing attack in Israel. Jewish gravestones were found desecrated on the Mount of Olives, east of Jerusalem. Rocks hurled by young Palestinians smashed windows of Jewish-owned cars in Abu Tor, a Jerusalem neighborhood nestled between the Jewish west and Arab east, and damaged a tram. These are just some of the Palestinian-Israeli clashes reported by local media — and largely ignored by the international press. They form part of the greatest upsurge of Palestinian protest in over a decade. While Israel’s upcoming election (and Benjamin Netanyahu’s bluster) has dominated overseas headlines, the Israeli-Palestinian conflict has heated up again. Like the prior intifada, or uprising, that began in 2000, this one is driven by the radicalization of Palestinian public opinion following a breakdown in the peace process and deepening conflict, making resistance appear the only remaining option to improve Palestine’s grim conditions. 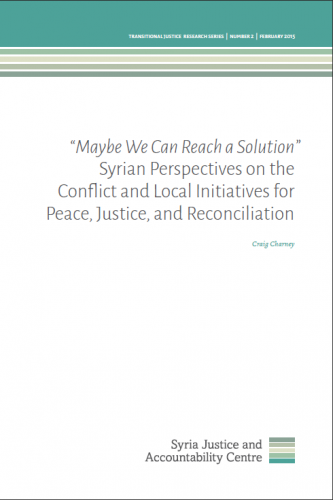 We are pleased to present findings from our most recent study for the Syrian Justice and Accountability Centre (SJAC): “Maybe We Can Reach a Solution”: Syrian Perspectives on the Conflict and Local Initiatives for Peace, Justice, and Reconciliation. This report covers the second phase of research for the Syrian Justice and Accountability Centre (SJAC), a Syrian-led organization promoting transitional justice and accountability. It is a qualitative study involving in-depth interviews among all the country’s major political, religious, and ethnic groups. Major insights first revealed by this report include growing divisions between pro- and anti-government Syrians, strong rejection of extremists and a desire to restore normal daily life. To Download a Copy of the Report Summary Click Here. To Download a Copy of the Full Report Click Here.